FABB encourages local members and other interested cyclists to attend a community meeting on proposed bicycle improvement projects in the Braddock District on Tuesday, April 12. 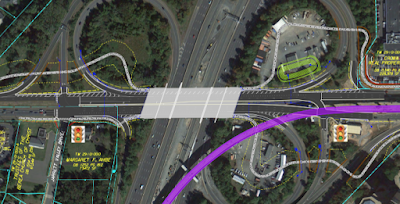 The meeting is being hosted by the Fairfax County Department of Transportation (FCDOT) and is being held from 6:30 to 8:30 p.m. at the Canterbury Woods Elementary School, 4910 Willet Drive, in Annandale. 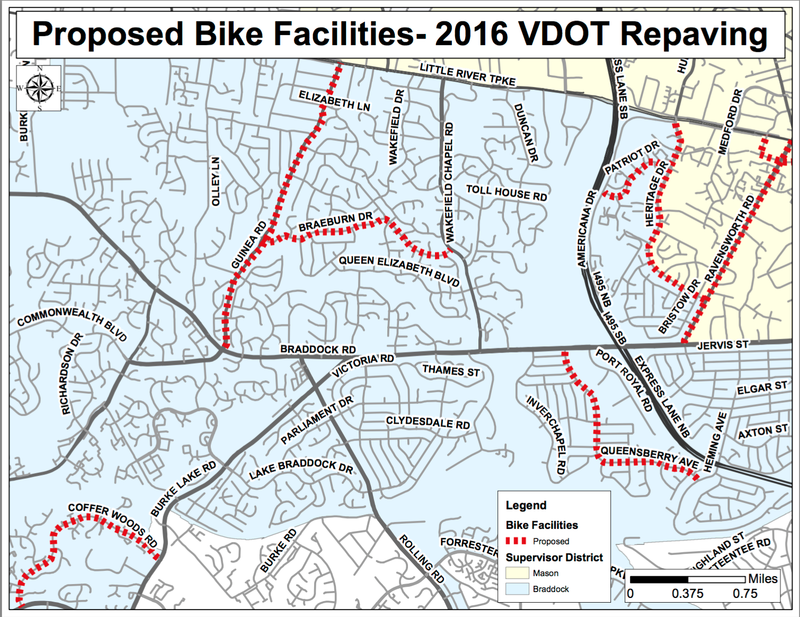 There are several bicycle projects proposed for Braddock District as part of the Virginia Department of Transportation's (VDOT) 2016 summer road repaving program. Improvements are planned for Ravensworth Road, Coffer Woods Road, Patriot Drive, Guinea Road, Queensberry Avenue, and Heritage Drive. It would be very helpful if local cyclists would attend to examine the details of the projects and to use their experience riding in the area to advise FCDOT on how best to accommodate cyclists’ needs with the repaving projects. 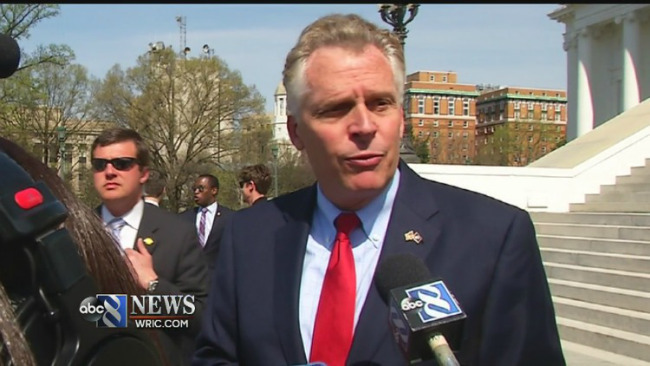 Sports Backers, with an assist from Virginia Governor Terry McAuliffe, announced on Wednesday the inaugural Ride to DC: Bike for Your Right event, a 160-mile ride from Richmond, Virginia to Gateway Park in Rosslyn on 23-24 July 2016. FABB is encouraging interested northern Virginia cyclists to participate in this challenging and fun advocacy ride to demonstrate our area’s strong support for bicycling in the Commonwealth. The ride will rely on back roads and trails to cover the distance between Richmond and Fredericksburg on the first day. On day two, riders will bike from Fredericksburg along the western border of Quantico Marine Corps Base into Manassas and Chantilly before joining the Fairfax County Parkway trail into Reston. From there, the riders will take the W&OD trail south to the Custis Trail and into Rosslyn. Early registration costs $150, which includes access to food and water stations every 15 miles and a complimentary beer for riders over 21 who make the finish line. Sports Backers, a Richmond-based sports commission that promotes active and healthy lifestyles, organizes and supports numerous nationally recognized sporting events. Sports Backers created Bike Walk RVA—a regional program to support bike and pedestrian friendly policies, programs, and infrastructure projects. During the past 23 years Sports Backers’ events have contributed to Richmond’s growing reputation for sports tourism, which has had a tremendous positive economic benefit for the region. 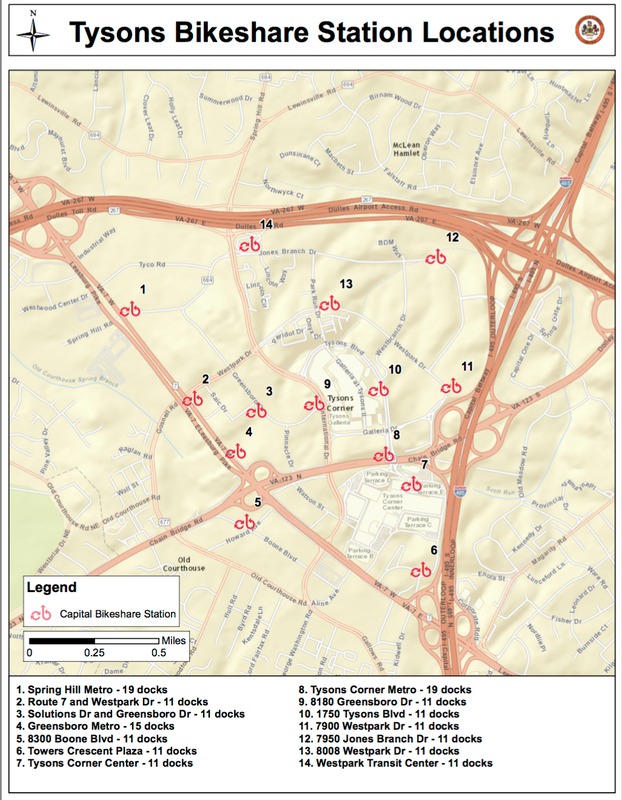 Fairfax County announced this week that 29 station locations for Capital Bikeshare have been chosen for Tysons and Reston and that the stations will open this fall. In January, the Board of Supervisors approved a $1.7 million plan to bring the Capital Bikeshare system to Fairfax and is complementing this action with ongoing FCDOT and VDOT efforts to create dedicated bike lanes in Tysons and Reston to make the program work. The Bikeshare system allows a person to check out a bike and ride short to moderate distances from station to station. Map courtesy of Fairfax county. A public hearing held by the Fairfax County and Virginia Departments of Transportation last Monday night (21 March) on bike lanes in the Mason District provided attendees with a great overview of current proposals. Their presentation was well received by the attendees, and Supervisor Penny Gross set a positive tone at the outset by expressing her full support for the proposed changes. 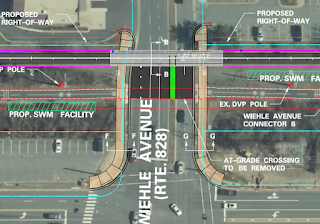 For fuller coverage on the proposed bike lanes, please see this report in the Annandale VA blogspot. Also, public comments are being received until April 8 and can be submitted on the form available on the county's Mason District Bike Lanes web page. Please make time to send supportive comments to help bring these improvements to our county’s bicycle infrastructure to fruition. Finding good bike parking in Fairfax can be a challenge. Fairfax County recently adopted bicycle parking guidelines that will be applied to future developments, but it's very difficult to retrofit bike parking at existing retail and commercial establishments. Even when there is bike parking it is often inadequate and installed in the wrong location. We recently produced a short, 4 1/2 minute video showing examples of good and bad bike parking. When we ask for bike parking we need to be specific. The best bike parking is a simple inverted U rack located on a hard surface, near the building entrance, preferably covered. If you like the video, please share it with others. If you ask for bike parking, use the bike parking guidelines as a reference. Rackspotter is a web app that can be used to identify bike parking locations. It was developed by BikeArlington and has been expanded to allow us to identify bike parking locations in Fairfax County. Please consider adding to the Rackspotter database. Over the past several years VDOT and Fairfax County have created several miles of bike facilities during our summer repaving season. Federal Highway Administration recently released the report Incorporating On-Road Bicycle Networks into Resurfacing Projects. 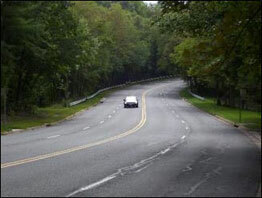 Two examples from Fairfax County are included in the report, Soapstone Drive and Lawyers Road. Installing bicycle facilities during roadway resurfacing projects is an efficient and cost-effective way for communities to create connected networks of bicycle facilities. 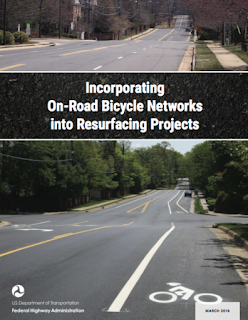 This workbook provides recommendations for how roadway agencies can integrate bicycle facilities into their resurfacing program. The workbook also provides methods for fitting bicycle facilities onto existing roadways, cost considerations, and case studies. The workbook does not present detailed design guidance, but highlights existing guidance, justifications, and best practices for providing bikeways during resurfacing projects. Fairfax County recently released the latest biannual Transportation Status Report. "The report includes updates on all active projects, including those projects in the Third Four-Year Transportation Program for FY2013 through FY2016 and the Board approved Transportation Project Priorities (TPP) for FY2015 through FY2020." Included is an interactive map of current projects. 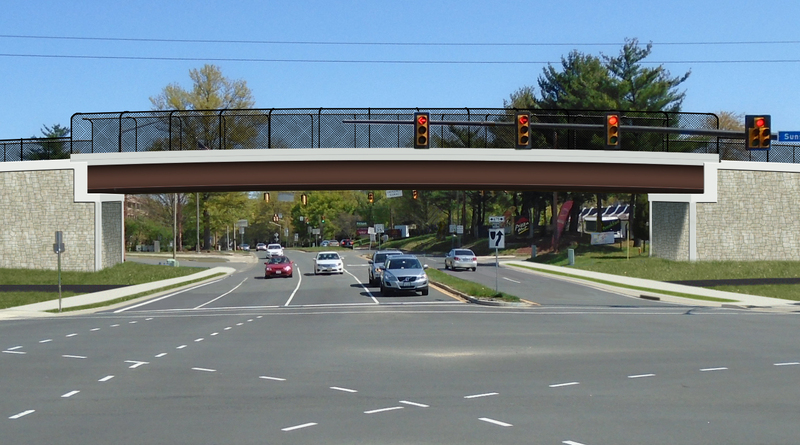 The Board directed FCDOT to lead the effort to improve bicycle and pedestrian safety and mobility, including constructing bicycle and pedestrian facilities in high-priority areas of Fairfax County. In 2006, the Board endorsed a Ten-Year Funding Goal of $60 million for new bicycle and pedestrian projects. Through FY2020, the Board has greatly exceeded this goal by selecting $314 million in high-priority bicycle and pedestrian improvement projects. Pedestrian and Bicycle Access and Safety: On December 8, 2015, FCDOT recommended and the Board approved projects for funding that were identified as part of the Herndon Metrorail Station Access Management Study (HMSAMS) and phase two of the Reston Metrorail Access Group Study (RMAG). The projects include sidewalk, trail, bike lane, and intersection improvements that will make it easier and safer for residents and visitors to walk and bike to the new Silver Line stations at the Reston Town Center, Herndon, and Innovation Center Metrorail Stations. Street Smart: FCDOT staff work with regional partners on the Street Smart Pedestrian and Bicycle Safety Media Campaigns. The twice-yearly campaigns utilize major-market television and radio, print, and bus advertising to promote safety awareness responsibilities of drivers and pedestrians in both English and Spanish. Bicycle Master Plan: The Bicycle Master Plan was adopted by the Board of Supervisors on October 28, 2014. Implementation of the Bicycle Master Plan began in 2015 and included over 30 miles of bicycle facilities as part of VDOT’s annual repaving program. Bike to Work Day: FCDOT hosted two bike to work day pit stops at the Burke Centre VRE Station and the Fairfax County Government Center. Over 70 bicyclists attended the Fairfax County Government Center pit stop and over 40 bicyclists stopped at the Burke Centre VRE Station. FCDOT also participated in Bike to Work Day by hosting a station to promote bicycling in Fairfax County and distribute information, maps, and promotional items at the Wiehle-Reston East Metrorail Station pit stop. Increase and Enhance Bicycle Parking: FCDOT purchased over 30 new bicycle racks and completed three new installations, with several more planned for 2016. Secure Bicycle Parking Facilities: Staff is finalizing work on new “Bike-and-Ride” facilities at various locations countywide including: Phase II Silver Line Stations, Stringfellow Road Park-and-Ride Lot, and Springfield Community Business Center Commuter Parking Garage. The bike-and-ride at Wiehle-Reston East Metrorail Station continues to be heavily utilized. Bicycle Route Signage-Countywide: Staff has completed planning and design for bicycle wayfinding to the Vienna/Fairfax-GMU Metrorail Station, Franconia-Springfield Metrorail Station, and Huntington Metro Station. Construction is planned for spring 2016, and additional wayfinding projects will be implemented throughout 2016. Western Fairfax Historic Cycle Tour: Cycle Tour Map is complete and sign design has been finalized. Printing and fabrication of map and sign is planned for 2016 along with installation of wayfinding signs. 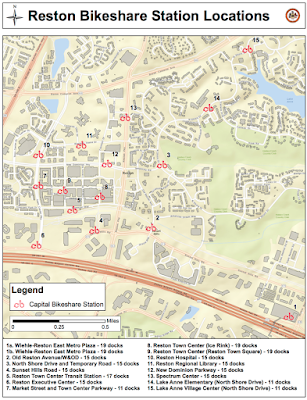 Fairfax County Capital Bikeshare: FCDOT staff completed field work to finalize station location recommendations for Capital Bikeshare in Reston. 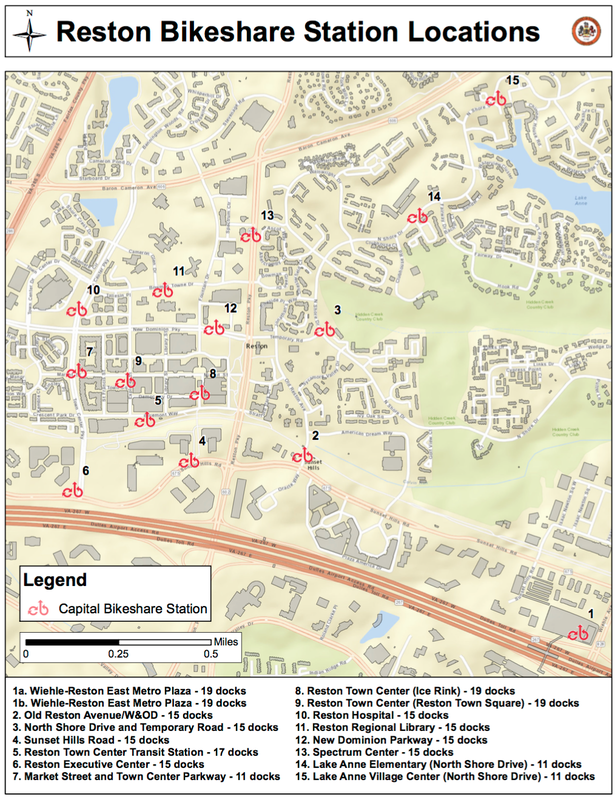 Capital Bikeshare in Reston will begin with 15 stations and 132 bicycles. FCDOT also will be launching Capital Bikeshare in Tysons with a 13 dock, 92 bike system. 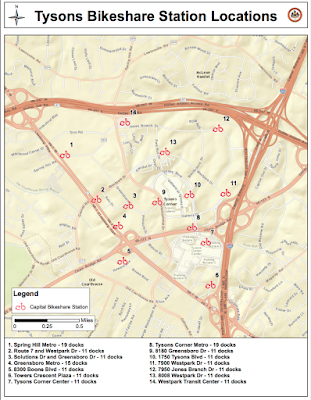 These two locations will be the first Capital Bikeshare locations in Fairfax County. On January 12, 2016, the Board of Supervisors approved $1.7 million to purchase bikeshare equipment to bring Capital Bikeshare to Reston and Tysons. 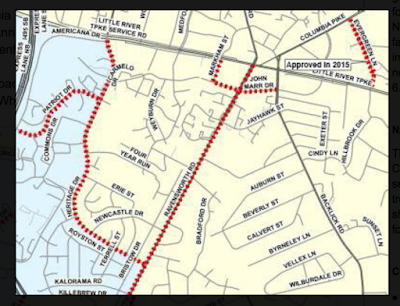 Cinder Bed Road Bikeway: FCDOT has received $500,000 in federal grants and has initiated an alternatives analysis to evaluate potential alignments for the Cinder Bed Road Bikeway. This project will provide a new bicycle and pedestrian facility approximately three miles in length connecting the Franconia-Springfield Metrorail Station and the Springfield Community Business Center to Fort Belvoir and other activity centers to the south. VDOT Repaving Program: VDOT and FCDOT completed their most successful year ever to add bicycle facilities during summer repaving. The summer 2015 program included over 20 locations with over 30 additional miles of bicycle facilities, including buffered bike lanes, bike lanes, and shared lane markings. Nearly all the proposed projects were completed in 2015, with some extending to 2016. FCDOT staff is currently reviewing VDOT’s 2016 paving plans to determine if additional facilities can be implemented this summer. The March FABB monthly meeting will be held at Poe Middle School, 7000 Cindy Ln, Annandale in the Mason District. The meeting starts at 7:30 p.m. on Wednesday, March 16. All cyclists are invited to attend and discuss how we can make the district more bike friendly. As we develop our priorities for the coming year we want to hear what you think are the most important projects in the area. Several FABB members attended the three-day National Bike Summit sponsored by the League of American Bicyclists in Washington, DC. During the Summit they were able to network with other Virginia advocates (BikeWalk RVA, VBF, BikeArlington, etc.) and others from around the country, learning and sharing about their mutual efforts. To advance our work in Fairfax County, the FABB attendees chose to focus on workshops to learn about the Bicycle Friendly America program, Mayor's Challenge for Safer Streets, bikeshare and Vision Zero. They also learned about bike education in schools and new counting/data collection methods. On the final day they joined hundreds of cyclists on Capitol Hill for Lobby Day. Fairfax County Department of Transportation recently held a meeting to ask people their thoughts about how to improve bike access to the Vienna Metrorail Station. The meeting was the kickoff of the Vienna Metrorail Bicycle Access Study. After a brief presentation, about 20 people gathered around maps of the station area to mark where improvements such as protected bike lanes are needed. The contractor, VHB, will take that input, conduct field work, and develop detailed recommendations. The study will be completed in June. Approximately $1M in project funds is available. Bike to Work Day, Tour de Fat, and DC Bike Ride are happening on Friday-Sunday, May 20-22. This year Fairfax is hosting 14 Bike to Work Day Pit Stops on May 20, and FABB will be at most of them discussing our work and handing out literature. On Saturday, May 21, FABB volunteers will help the fabulous Tour de Fat folks hold the best bike party of the year. If you're interested in helping out during either the morning or afternoon shifts, please let us know. DC Bike Ride is a car-free ride through the District on Sunday, May 22. Finally, May 4 is National Bike to School Day. Why not reach out to your local school to see if they have activities planned and/or need help with bike rides to school? Adventure Cycling Association, Reston Association, and Reston Bike Club held a special gathering on Sunday, March 6. Adventure Cycling staff members Ginny Sullivan and Saara Snow discussed events planned for Adventure Cycling’s 40th anniversary: National Bike Travel Weekend, June 3–5, the Montana Bicycle Celebration, July 15–17, and Bike Your Park Day on September 24. They also highlighted their tours program, membership, new routes, progress on the U.S. Bicycle Route System, and other national advocacy projects. FABB discussed our work along with presentations by Friends of the W&OD Trail, Reston Bike Club, and WABA. Adventure Cycling is a great national bike organization and if you aren't a member, we recommend that you join. If you would like to join, contact me and I'll send you a redemption code for a free 6 month membership (new members only, 2 codes available). Two bike bills are making their way through the Virginia legislature. SB 117, the Dooring bill "Requires drivers to wait for a reasonable opportunity to open vehicle doors on the side adjacent to moving traffic. A violation constitutes a traffic infraction punishable by a fine of not more than $50." The bill was approved by both the Senate and House and will go to Gov. McAuliffe for his signature. Thanks to everyone who wrote to your legislators to urge them to approve the bill. Thanks also to Senator Chap Petersen for sponsoring the bill and working to ensure it made it through both houses. SB 669, the Maintenance Reimbursement bill "Provides that cities and towns that receive highway maintenance payments from the Commonwealth based on moving-lane miles of highway will not have such payments reduced if moving-lane miles of highway are converted to bicycle-only lanes..." This bill was "Continued to 2017." 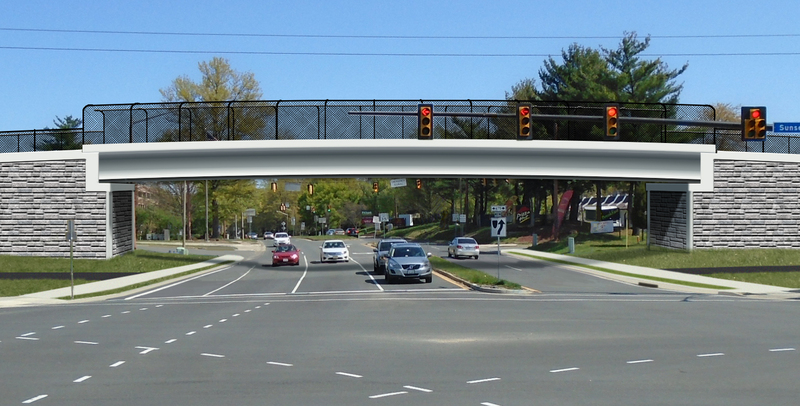 Fairfax County plans to build a bridge on the W&OD Trail over Wiehle Ave. A public hearing on the project will be held on Thursday, March 17 from 6:30-8:30 p.m. at Reston Community Center at Hunter Woods, 2310 Colts Neck Road, Reston. This is an opportunity to learn about and discuss the current design options. The Wiehle Ave crossing has been the site of several bike crashes in the past. This bridge will allow cyclists to completely bypass the at-grade crossing. Access to Wiehle Ave from the W&OD Trail will be via paved side trails from east and west of the bridge. See the FABB blog for current plans and design concepts. 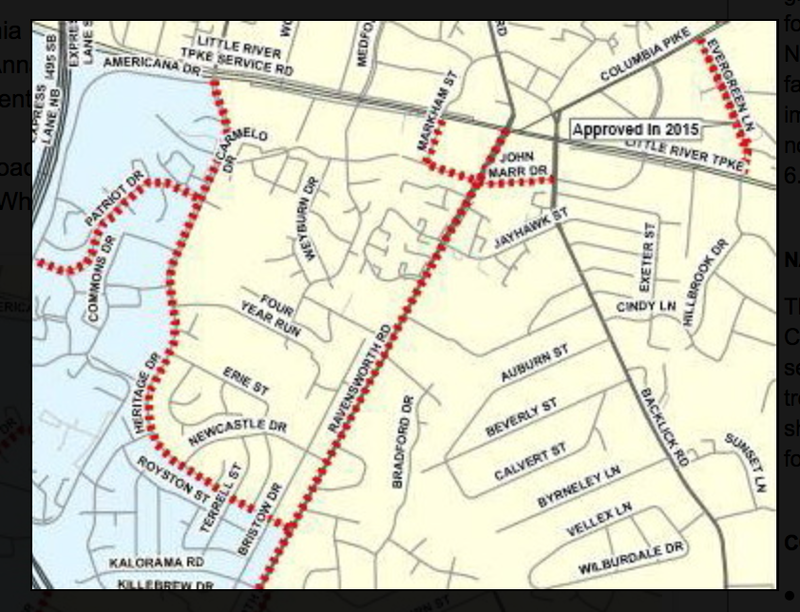 Fairfax County will hold a meeting on March 21 to discuss plans to install bike lanes on several roads in the Annandale area as part of the summer repaving cycle. Cyclists are encouraged to attend the meeting to support the projects. Without your support these projects may not happen. From the Fairfax County site Mason District Bike Lanes: "Join Fairfax County Department of Transportation staff on Monday, March 21, 6:30-8 p.m., at the George Mason Regional Library, 7001 Little River Turnpike in Annandale, and learn about proposed bicycle enhancements that can be implemented with road repaving this year. Bicycle facilities are proposed on Heritage Drive, John Marr Drive, Markham Street, McWhorter Place, and Ravensworth Road." 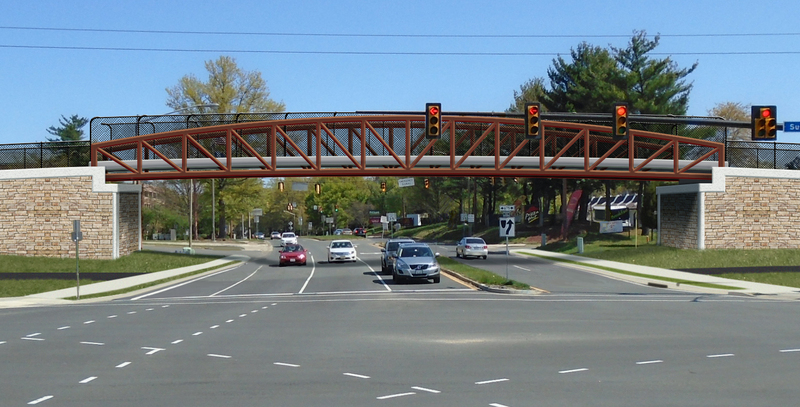 March 16 - FABB Monthly Meeting in Mason District, Poe Middle School at 7:30 p.m.
March 17 - Public Hearing on W&OD Trail Bridge over Wiehle Ave, Reston Community Center at Hunter Woods at 6:30 p.m.
March 21 - Meeting on bike lanes in Annandale, George Mason Regional Library at 6:30 p.m.
May 4 - Bike to School Day - See who is biking or register your event. May 22 - DC Bike Ride - Ride on car-free DC streets. It's time to recruit your friends, neighbors, and co-workers to try bike commuting for a single day, Bike to Work Day on Friday, May 20. They might find that bike commuting for all or part of their commute can be a fun, efficient way to get to work. This year there are 13 Fairfax pit stops (14 if you include the Falls Church stop just outside the county). FABB volunteers plan to have newsletter sign-up sheets, maps and other literature at each of the pit stops. If you can help, send a note to info@fabb-bikes.org. The only problem bike commuters might have today is the chance of rain this afternoon and trails that are possibly more crowded than usual. There may also be more frustrated drivers than usual with Metro closed and many more people driving. As I watched the morning news to see the effects of the Metro closure it occurred to me that local news programs should regularly show traffic on the Custis, W&OD, and Mt Vernon Trails in Virginia to let people know what conditions are like and show non-bike commuters that there really is another way to get around this area. Try not to be too smug as you pass all those frustrated drivers today. Join Fairfax County Department of Transportation staff on Monday, March 21, 6:30 - 8 p.m., at the George Mason Regional Library, 7001 Little River Turnpike in Annandale, and learn about proposed bicycle enhancements that can be implemented with road repaving this year. 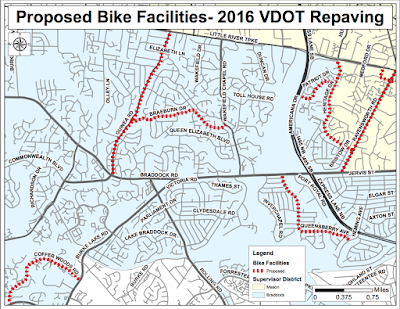 Mason District soon may have new bike lanes, as part of VDOT's summer road repaving projects. Bicycle facilities are proposed on Heritage Drive, John Marr Drive, Markham Street, McWhorter Place, and Ravensworth Road. Click on the image to enlarge the map. 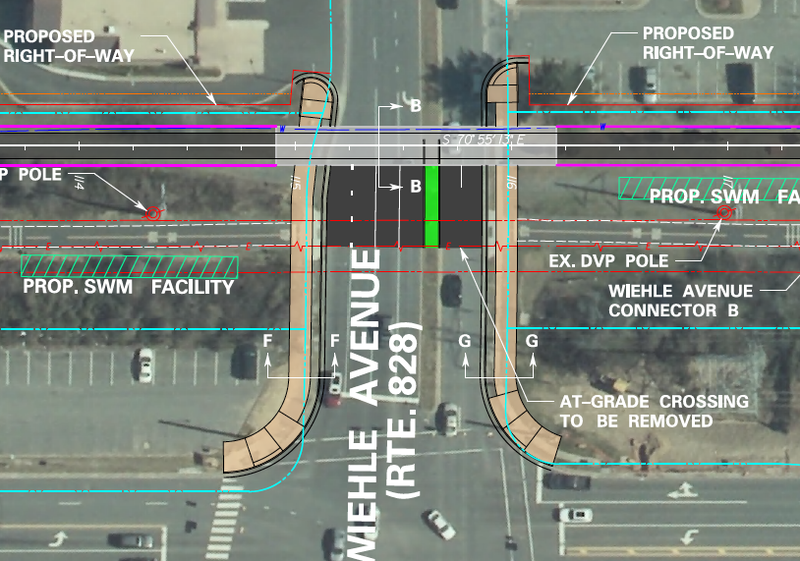 Fairfax County plans to build a bridge over Wiehle Ave on the W&OD Trail. A public hearing on the project will be held on Thursday, March 17 from 6:30-8:30 p.m. at Reston Community Center at Hunter Woods, 2310 Colts Neck Road, Reston. This is an opportunity to learn about and discuss the current design options. The Wiehle Ave crossing has been the site of several bike crashes in the past. This bridge will allow cyclists to completely bypass the at-grade crossing. Access to Wiehle Ave from the W&OD Trail will be via paved side trails from east and west of the bridge. Two engineering concepts have been developed that vary according to the slope of the bridge, either 3% or 5%. With the 3% slope the approach to the bridge would be easier to climb, but the access trails to reach Wiehle would be long. The 5% slope (or grade) would have a shorter, steeper approach to the bridge and as a result, the access trails will be shorter. 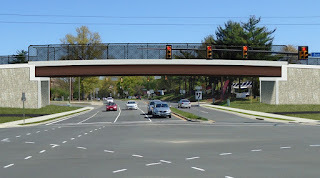 The W&OD Trail bridge over Herndon Parkway (on the east side of Herndon near the police station) has about a 5% grade when approached from the west. The Town Center Parkway bridge has about a 3% grade (at least according to my iPhone app TiltMeter). The bridge will cross Wiehle where the gravel trail currently crosses. 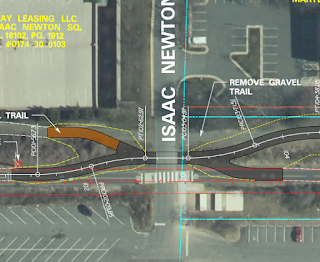 The current paved trail will serve as the access trail to/from the W&OD Trail to Wiehle Ave. With the 3% grade concept, because the bridge and supporting structure are longer, the access trails are longer and join the W&OD Trail near the Isaac Newton Square/Metro Center Dr intersection and the Michael Faraday Dr intersection. With the 5% grade concept the access trails join the main W&OD Trail midway between those two intersections (This is difficult to describe. See the full pdf design concept for 3% grade and 5% grade for details). Below are excerpts from the design drawings and the conceptual rendering from street level, looking north from Sunset Hills Dr.
FABB will be meeting in Mason District this month as part of its effort to better serve and represent cyclists and other supporters throughout the county. We encourage all FABB members and others interested in making bicycling better in Fairfax and in Mason District to join us at 7:30 pm on March 16, at the Poe Middle School Cafeteria at 7000 Cindy Lane in Annandale. This meeting will provide a great opportunity to learn about current and future bicycle plans in the Mason District. We also plan to have a discussion of the Safe Routes to School program and ways to encourage children to ride bicycles. In addition, the meeting will be a forum to share your concerns about and suggestions for improving bicycling in the district and Fairfax County and to hear from local cyclists about nearby trails and routes. During 2016 FABB plans to hold monthly meetings in all of the county’s districts. If you would like to assist in setting up the program for the meeting in your district, please contact Steve Ward at srward1057@gmail.com. It's not a good sign when an article about the passage of the dooring bill in Virginia has the title "Hey, bicyclists: You got your Virginia dooring law – now stay off the sidewalks." The story appears in the Post's Tripping section ("A blog about how we get around.") by Fredrick Kunkle. Kinkle writes that the dooring only applies to the driver side door: "We might argue that if you nail an adult riding his or her bicycle on the sidewalk, you should get a $50 award. Double, if it’s during lunch hour on K Street." You may recall the anti-bike rant by Courtland Malloy back in 2014 in which he said: "It’s a $500 fine for a motorist to hit a bicyclist in the District, but some behaviors are so egregious that some drivers might think it’s worth paying the fine." Since the Post linked to Milloy's article, we can only speculate that the Post encourages this type of inflammatory writing to attract readers, comments, page views. I like the Post. I read it every morning. I'm very disappointed that it's OK to make light of injuring or killing cyclists. I thought it was beneath them. Apparently not. By the way, riding on the sidewalk in Fairfax County is legal. VDOT is holding a "Pardon our Dust" meeting on the project to rebuild the Route 7 bridge over the Dulles Toll Road. The meeting is tonight, Wednesday, March 9, 6 - 8 p.m. at Colvin Run Elementary School, 1400 Trap Road, Vienna. There are no bike/ped facilities on the bridge connecting areas to the west of Tysons with Tysons and the new Silver Line stations. The current innovative design for the bridge includes trails on each side of the road with ramp crossings that are separated from high speed traffic using bridges or underpasses. This is a great design and we strongly support the project. Staff from VDOT, Wagman Heavy Civil, Inc., and Rinker Design Associates will be on hand to discuss the project, potential traffic impacts and construction schedule. This project will replace and widen the bridges, as well as widen the section of Route 7 from four to six lanes from Jarrett Valley Drive to just west of Tyco Road. A new 14-foot shared-use path will be added. Utility relocation starts this month, with construction beginning in early to mid-March. The project will be complete in spring 2018. 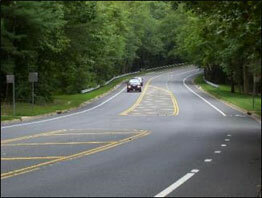 For more details, visit the Route 7 Over Dulles Toll Road project website. Today the full Virginia House of Delegates voted to approve the Dooring Bill, SB 117, on a vote of 70-25. The bill was previously approved by the Senate so it's our understanding that it now goes to Governor McAuliffe for his signature. Thanks to everyone who wrote to your legislators to urge them to approve the bill. Thanks also to Senator Chap Petersen for patroning the bill and working to ensure it made it though both houses. SENATE BILL NO. 117 Offered January 13, 2016 Prefiled December 28, 2015 A BILL to amend the Code of Virginia by adding a section numbered 46.2-818.1, relating to opening of motor vehicle doors. No person shall open the door of a motor vehicle on the side adjacent to moving traffic unless it is reasonably safe to do so. A violation of this section shall constitute a traffic infraction punishable by a fine of not more than $100. No demerit points shall be awarded by the Commissioner for a violation of this section. The provisions of this section shall not apply to any law-enforcement officer, school guard, firefighter, or member of an emergency medical services agency engaged in the performance of his duties. According to Virginia Bicycling Federation, (VBF) two bike bills have made it out of committee and will soon be voted on by the full House of Delegates. SB 117, the Dooring bill "Requires drivers to wait for a reasonable opportunity to open vehicle doors on the side adjacent to moving traffic. A violation constitutes a traffic infraction punishable by a fine of not more than $50." SB 669, the Maintenance Reimbursement bill "Provides that cities and towns that receive highway maintenance payments from the Commonwealth based on moving-lane miles of highway will not have such payments reduced if moving-lane miles of highway are converted to bicycle-only lanes..."
It is now time to contact YOUR DELEGATE and ask them to support both SB117, the Dooring bill, and SB669, the Maintenance Reimbursement for travel lanes that have been converted to bike lanes bill, as both are now on the floor of the Full House. It’s official: Capital Bikeshare is coming to Fairfax County in 2016! The Fairfax County Board of Supervisors approved a plan to bring Capital Bikeshare stations to two major areas of the county this year that will increase the number of travel options for residents and commuters. Bikeshare is going to become an important part of Fairfax County’s efforts to promote bicycling and walking in the region, and helps support the county’s Strategic Plan to Facilitate Economic Success. This year, Reston will get 15 stations in and around the Reston Town Center, while Tysons Corner will get 11 stations in the area between Route 7, Route 123 and the Dulles Toll Road. Stations in both areas will provide Silver Line Metro riders with more options to make that first or last mile of their trip by bike. Members in Fairfax can also connect with the rest of the Capital Bikeshare system across the region to make transit trips easier than ever. County transportation staff are currently evaluating potential station locations in both areas. Stay tuned for future announcements as stations are installed and our fifth jurisdiction joins the ranks of Capital Bikeshare locations! Do you want better bike access to the Vienna Metro Station? To you want to be able to use the I-66 parallel trail to reach the station? This is your chance to learn about plans for improving bike access as part of the Vienna Metrorail Bicycle Access Study at a meeting tomorrow night., 6-8pm at Oakton HS. The Vienna Metrorail Bicycle Access Study will look at ways to improve bicycle access to the Vienna Metrorail Station on Nutley Street, Virginia Center Boulevard, County Creek Road and Sutton Road. 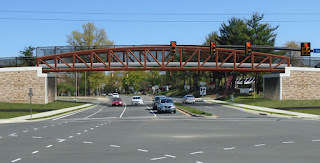 A kick-off meeting will be held on Wednesday, March 2, 6 – 8 p.m., at Oakton High School cafeteria (2900 Sutton Road, Vienna, Va., 22181) to introduce the public to the project. The meeting will consist of a presentation and a breakout session to gather feedback on existing conditions, areas of concern, ideas for improvements and overall goals for bicycling in this area. Thank you for contacting the Virginia Department of Transportation’s Customer Service Center with your request. Please call the Customer Service Center if you have further questions. We appreciate your efforts to help keep Virginia roads safe. The snow in question was put on the sidewalk by a VDOT crew when it was decided to clear the street from curb to curb. They could have left some snow in the road; the road was passable before they dumped the piles of snow on the sidewalk. Basically the message is, it's more important to make sure the road is completely clear of snow than it is to have a sidewalk passable for kids walking to and from school. I see kids and adults walking in the street every day at this location. I will say that the myVDOT site for reporting road problems works. Usually within a day or two you will receive a response regarding any problems reported. It may not be the response you want but it will be a response. The forms are geared toward reporting road problems and that needs to be updated, but the service works well. Today was the Fairfax Co Board of Supervisors' Snow Summit. We'll report on the summit in a later post.